The launch of a brand new experience in bus travel between Gosport and Fareham started on the 22nd April 2012. The long awaited ‘Eclipse’ branded routes opened using part of the former railway track bed between the two towns as a rapid bus link. The advantage of a straight unhindered run is obvious when the alternative congested A32 road is considered. Timings improved as a result of this, leading to a guaranteed journey time of 30 minutes. Two routes (E1 and E2) were launched to replace former bus routes (86 and 82 respectively) along the main road. From Fareham, both make use of the 4.5km former railway line named ‘Henry Cort Way’ and then the E1 runs via Elson and the E2 operates via Ann’s Hill Road to Gosport Bus Station. The busway runs on the disused line between Redlands Lane, Fareham and Tichborne Way, Gosport where it leaves to join the normal road network at Hutfield Link. 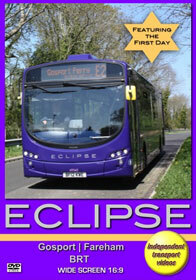 The first part of this programme reveals the actual running of the Eclipse buses on the first day, featuring the brand new gleaming purple Volvo B7RLE single deckers. Our cameras then return to Fareham in the July of that year to see the Volvos in action some three months into operation of the ‘Bus Rapid Transit’ system. In the second part of the film our cameras return three years later and travel along the route inside the Eclipse buses. The buses are also filmed from various locations along the routes. Now that all the excitement of a new service has gone, the day-to-day operations become part of local bus operations. There is even a quick glimpse of what the railway line looked like in 2009 with tracks still in place at Gregson Avenue, Gosport with a ‘then and now’ comparison. At both Gosport and Fareham bus stations, you will see many of the contemporary Volvos, Streetlites and Optares as well as a chance viewing of a Portsmouth, ‘Star’ branded Streetlite at Fareham and a driver-training vehicle making use of the busway. At the time of the launch, the promotional material suggested a ‘better bus experience’ with leather seats, Wi-Fi, real time arrival information, on-board news updates and frequent services. With an Eclipse running every six minutes during the weekday, this project continues to reflect that idea and after three years, it is carrying more passengers each year. It was an overdue improvement to the local infrastructure with plans on the drawing board since 1973 for a light rapid transit system between Fareham and Portsmouth via Gosport using a tramway which went beneath Portsmouth Harbour. Although a smaller version of that dream, the Eclipse is a very busy part of the current travel network in the Gosport and Fareham area.